There was a Melava Malka held this past Motzei Shabbos Parshas Lech Lecha, in appreciation of the dedicated volunteers of the Chaveirim Organization from Boro Park, Williamsburg, Flatbush and the Catskills. The event was held in Ateres Chaya Hall in Boro Park, and was well attended by many elected officials, and members of law enforcement. Founded by R’ Aaron Yitzchok Cohen and a group of concerned individuals immediately after the tragedy of September 11, 2001, Chaveirim was launched to provide non-emergency, volunteer aid that would be within the capacity of a grass roots organization. Working to assist motorists stranded due to minor hurdles, such as car lockouts, flat tires or running out of gas, as well as helping the elderly & handicapped in our community with their daily needs, the Chaveirim hotline has been handling hundreds of calls daily, with an astonishing 250,000 calls logged to this date. Chaveirim encompasses a network of more than 300 volunteers, equipped with an advanced dispatch and communication system, and is constantly expanding to new communities. 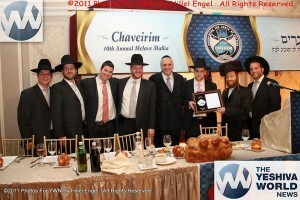 Chaveirim operate in the areas of North and South Brooklyn, New York City, and the Catskills during the summer weeks. New recruits are screened and background checked to ensure their competency. This is followed by an extensive training course, which includes live presentations, to lay emphasis on efficiency and professionalism. Equipment is then distributed to the volunteers to gear them up for the task. YWN PHOTO LINK: Click HERE for photos by Hillel Engel. They are a great organization! Thanks to Chaveirim many people were already helped in time of need. Try giving those men a tip… They’re never going to take it from you. Thumbs up to them. Mi keamchu yisroel!